Book DescriptionGain the advantage over your opponent with easy-to-remember strategies from one of the world's top chessplayers! Strategy - it's the ultimate secret weapon for championship players around the world. 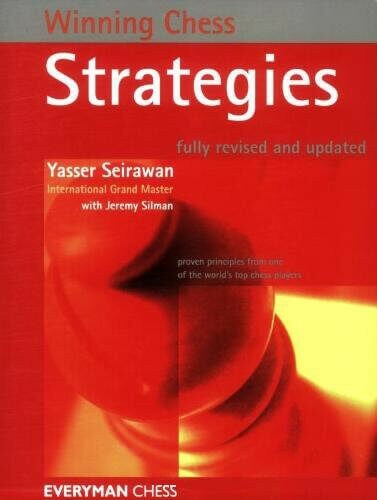 Drawing on his considerable experience in tournament play, Yasser Seirawan shows you how to apply flexible strategic principles to every part of your game. Using Seirawan's simple and effective planning and analysis techniques, you'll enter each game with confidence and energy, ready to play forcefully and intelligently - the way you need to play so you can win! Knock you opponent off balance with bold opening moves; formulate an overall game strategy before the middlegame; interpret the motivation behind your opponent's moves; position yourself for a winning endgame. Diagrams throughout the book illustrate game positions, and you'll meet some of history's great chess strategies, learning from them move by move. Whether for reference during practice games or simply for pleasure reading, this book is an information-packed resource you'll turn to time and again.